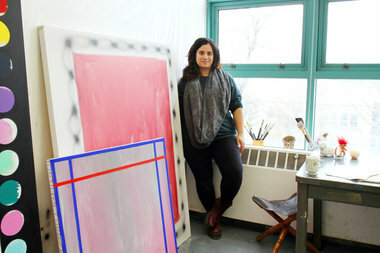 Nicole Mouriño, in her studio, will be one of the first to graduate from Social Practice Queens. JACKSON HEIGHTS — An artist living in Queens found the ideal place to continue her studies in a new masters program that blends art and social action. Nicole Mouriño, 27, graduated with a bachelor's degree in art from Pratt Institute but found herself at a crossroads in 2012, as she wanted to pursue her education further. She just didn't know exactly what to do. "I felt like I was being pulled in two directions — studio arts and arts administration," she said. "I was doing endless research for an MFA program that would respect those efforts regardless of the art school binaries." Through her research she found the new Social Practice Masters of Fine Arts program offered through Queens College, which began taking applications in 2013 for the 2014 semester. Three students currently attend the program. The instructors behind Social Practice Queens, with a partnership with the Queens Museum, weren't interested in the elite art world, they told DNAinfo in 2013. “We're not interested in being engaged with the elitist art world," instructor Maureen O'Connor said at the time. Mouriño, who lives in Jackson Heights, was drawn to the newness of the program and said she saw more possibilities for herself and her art there. "I wanted to be a part of something that is fresh and growing, and I also want to be a part of this public institution that's feeding another public institution," she said. The MFA concentration utilizes the art spaces at Queens College and Queens Museum, drawing from the museum's community engagement. Mouriño's benefited by using space at the college and museum and is considered an "artist in residence" there. In addition to her classes and work as a teaching assistant, she works full-time at Blick Art Materials in SoHo. The job has not only given her the chance to meet some of her artistic idols, they are sponsoring her senior thesis show — providing her with discounts on the supplies she needs to make her art. "I wouldn't really be able to have a body evocative of my language towards the end of my MFA without support," she said. She will graduate from the program in 2016 and continues to draw inspiration from her neighborhood and peers. The program never felt constrained and all of the artists were allowed to explore whatever theories they wanted to inspire their work, she said. "It's sort of the spirit of the program that's been the most fulfilling for me," she said. "That's been the most rewarding experience for me, that I can bounce around however I feel necessary and feel grounded, and not questioned or disenfranchised from my friends."